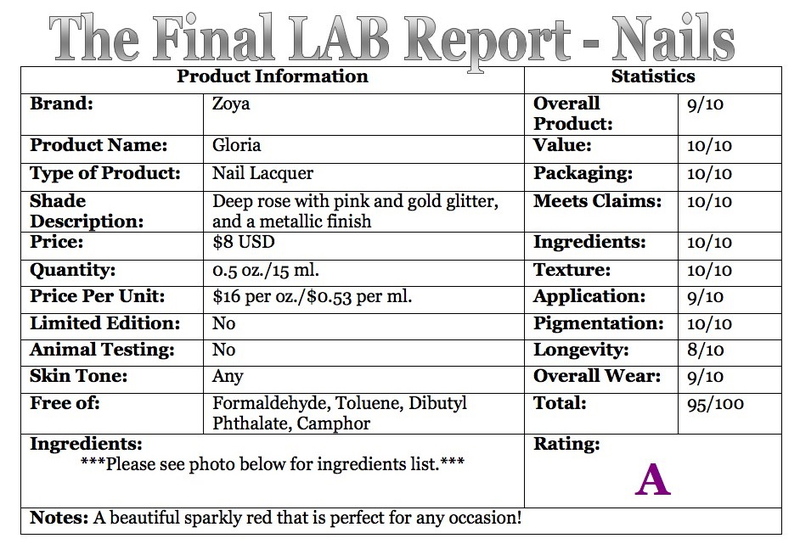 Yes, yes, I know, it is not longer the holiday season, but it is still winter and that is a good enough reason for me to review Zoya Gloria Nail Lacquer ($8 USD for 0.5 oz./15 ml.). It is described as having “rose, mauve-pink and magenta foil particles with gold and subtle red metallic accents. A delicate winter rose look made unique with a flashy foil finish.” The different shimmer and glitter particles give this shade a lot of dimension that makes it suitable for any occasion. I was a little concerned when I applied the first coat of Gloria on my nails because it had a thin texture, sheer opacity, and was a little streaky. However, the second coat applied beautifully, evenly, and was fully opaque after the second coat. I did apply a third coat to see if the opacity would deepen, but there was no difference between the second and third coast. 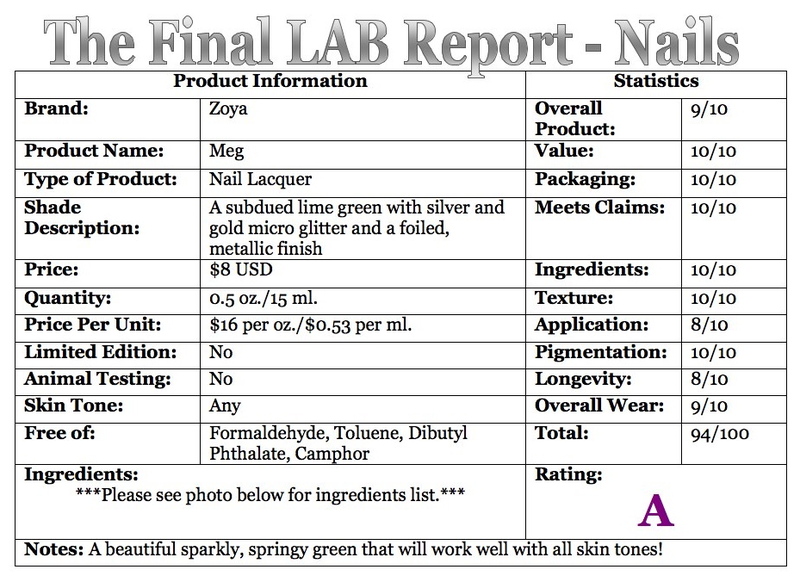 Zoya’s website states this color’s intensity as a 5 (1 = sheer – 5 = opaque). Despite the ample amount of glitter in this polish, it dried to a nice glossy finish and did not feel gritty. My experience with Zoya’s lacquers is they last at least seven days with just minor tip wear and no chipping. Gloria wore well for the eight days I texted it. However, I noticed the tip wear occurred sooner than normal and I noticed a tiny chip on my thumb on the fifth day of wear. I used Zoya Anchor and Zoya Armor for my base and top coat. Your Nails Will Thank You! Remove Plus is supposed to “clean and prep nails while moisturizing, nourishing and fortifying the nail plate for guaranteed extended polish wear. 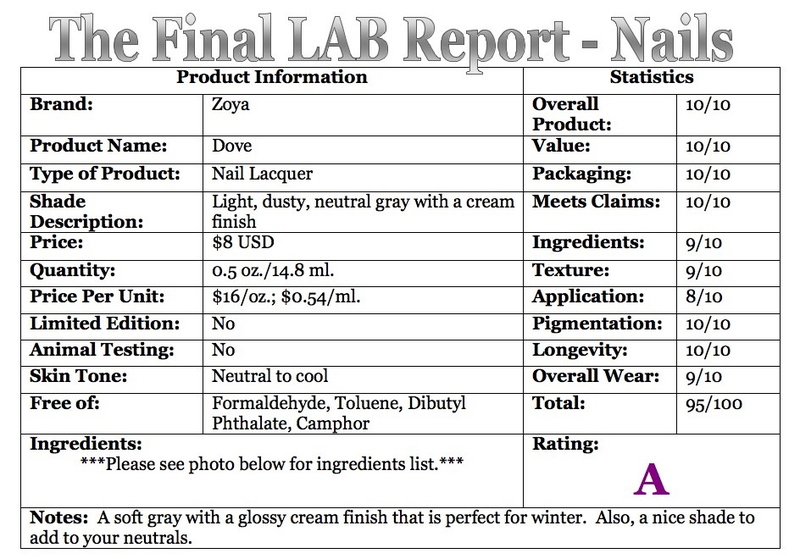 Nails are left without a trace of nail lacquer, without streaking or staining, hydrated and ready for a base coat.” It is step 1 of Zoya’s Color Lock System and I love, love, love this product! I use a cotton ball and only need two pumps of the remover to remove nail polish from five of my fingers. I hold the saturated cotton ball on each nail for about 30 seconds, then wiggle the cotton ball back and forth a few times, and swipe away the nail polish. Most polishes are completely removed after the first swipe, but darker polishes, or ones with glitter, may need an additional swipe or two. 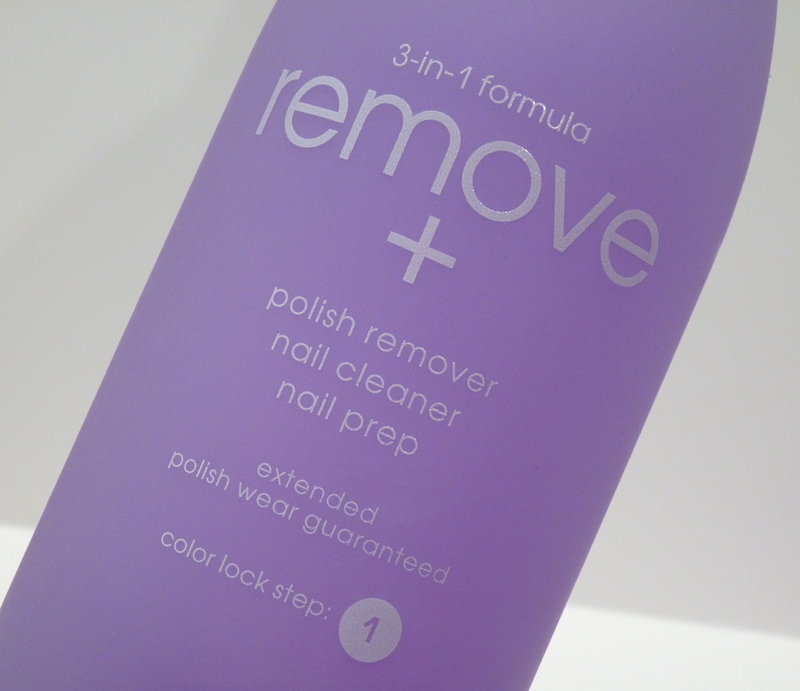 Not only does Remove Plus remove lacquer quickly, it also leaves my nails and cuticles feeling moisturized. I never feel the need to wash my hands after use, as no residue is left behind. My nails feel clean, prepped, and ready for my base coat. The packaging of Remove Plus is very practical. The pump makes it easy to dispense just right amount of product and it also locks to prevent leaks/spills when not in use. 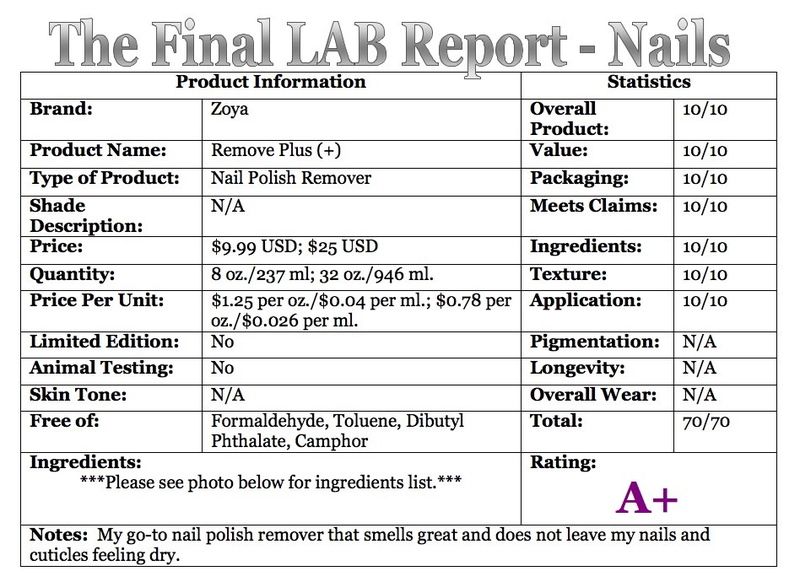 The price may seem a little steep for a nail polish remover, but if you change your nail polish frequently, or swatch several polishes back-to-back for reviewing purposes, it is really important to preserve the health of your cuticles and nails. Once I realized I loved this product, I started buying the 32 oz. size, which reduces the price per ounce by about 37.5%. That is a great savings! If you are fond of lavender-scented products, then you will enjoy the scent of this remover. I can still detect a slight acetone scent with this, but it is not nearly as pungent as using pure acetone.